All seating is reserved. Call the Box Office for assistance with handicapped accessible seating or with other seating questions. Please note that there are 2 performance times for this event. Please be sure that you are buying tickets to the correct event before finalizing your purchase as ALL TICKET SALES ARE FINAL. Tickets to this event can not be refunded or exchanged for another performance time. There are 2 price levels available for this performance. Please be sure to select the correct price level when making your seat selections. Note that all patrons, regardless of age, must have a ticket to attend a performance. Group rates are available for groups of 8 or more. Please call the Box Office to purchase tickets at the group rate. Tickets to this event will be on sale online until noon on Saturday, May 11. After this time, tickets for this performance can be purchased at the door beginning at 1 PM. 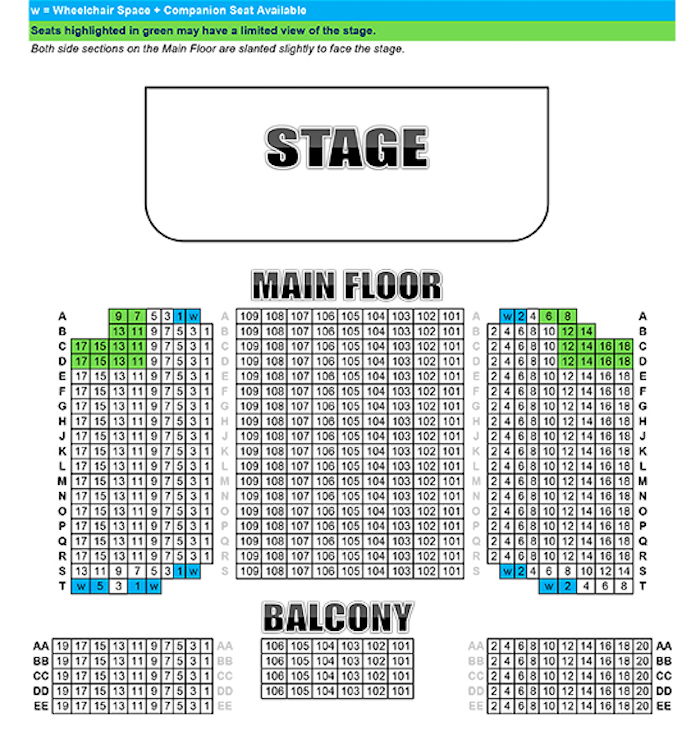 YOU MUST CLICK ON A SECTION OF THE AUDITORIUM ON THE SEATING MAP BELOW TO SEE SEAT AVAILABILITY.